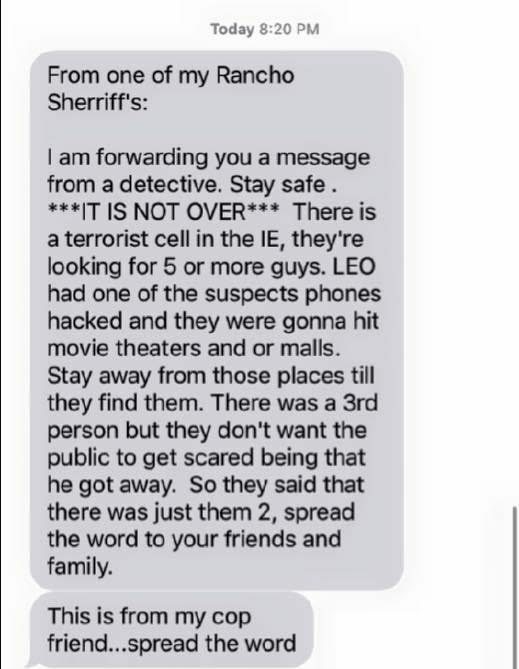 A text message warned San Bernardino-area residents attacks were "not over," but the FBI said the claims were a hoax. Claim: A credible law enforcement source warned Bernardino residents “it’s not over” after a 2 December 2015 shooting, adding future attacks are expected. I’ve seen this multiple times on Facebook. Living near San Bernardino I’d like to see if this is a hoax. Origins: A large mass shooting in San Bernardino on 2 December 2015 resulted in the deaths of 14 people; in the aftermath of the incident, law enforcement agencies indicated to the public and the media that an investigation remained active and ongoing (repeatedly discouraging speculation and premature conclusions). I am forwarding you a message from a detective. Stay safe . ***IT IS NOT OVER*** There is a terrorist cell in the [Inland Empire], they’re looking for 5 or more guys. LEO had one of the suspects phones hacked and they were gonna hit movie theaters and malls. Stay away from those places till they find them. There was a 3rd person but they don’t want the public to get scared being that he got away. So they said there was just them 2, spread the word to your friends and family. This is from my cop friend…spread the word. The text message was one of several purported surreptitious warnings from a law enforcement source that circulated in late 2015. Following the 13 November 2015 Paris attacks, similar texts warned of planned ISIS attacks at malls and other public places. As with a November 2015 New York City subway warning, the text’s sender claimed that the information was kept under wraps by authorities so as not to cause “panic.” (An odd assertion given that attacks on civilians tend to cause more worry than warnings about them do.) As with any rumor of this variety, there’s no good reason to expect that law enforcement agencies would prioritize civilian panic over massacre prevention, nor conceal credible information about possible attacks by which casualties might be prevented. Rumors warning of imminent future incidents invariably spread after high-profile attacks on civilians. In some respects, such claims provide a small measure of reclaimed safety; random attacks are far scarier than ones you can avoid simply by Christmas shopping via Amazon and avoiding the local galleria. Moreover, the tales served to alleviate grief and regret for those who weren’t warned in advance of the danger that awaited them. We contacted the San Bernardino County Sheriff’s Department to determine whether circulating information about further attacks was credible. The individual to whom we spoke confirmed that the Federal Bureau of Investigation (FBI, now heading up the shooting investigation) investigated the claim and determined it was a hoax. We don’t have any information or credible threats about this.